For the rest of this summer, we will operate on a once-a-week reduced schedule, with occasional exceptions. The next scheduled update will occur on Monday 2012-05-21. In panel 1 of 6, a man holds what might be a smartphone to his right ear with his right hand. In front of him the display on an open laptop computer shows a small logo composed of multiple partially-drawn cubes accompanied by the text: Free EC2 Server. Man: Hi, I see that you’re advertising a free Amazon cloud server. Can you tell me where it would be located? Voice from phone: Sir, if you knew its location, it wouldn’t really be a cloud server. In front of her a computer monitor displays the text: Sir, if you knew its hardware specs, it wouldn’t really be a cloud server. Voice from headset: Ah! Can you at least give me its hardware specs? Woman: Sir, if you knew its hardware specs, it wouldn’t really be a cloud server. Panel 3 shows the man in a larger view, still holding the smartphone. Man: I see the pattern. 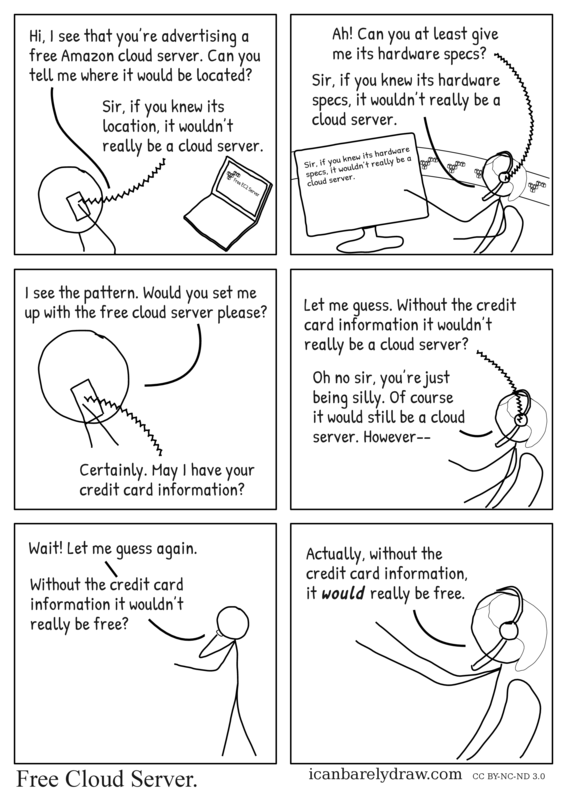 Would you set me up with the free cloud server please? Voice from phone: Certainly. May I have your credit card information? Panel 4 shows the woman again, still wearing a headset. Voice from headset: Let me guess. Without the credit card information it wouldn’t really be a cloud server? Panel 5 shows the man, now standing, with a phone still on his right ear. Man: Wait! Let me guess again. Man: Without the credit card information it wouldn’t really be free? The final panel 6 shows a more enlarged view of the woman, still wearing the headset. The woman holds out and forward both her arms, slightly bent, with forearms pointing slightly upwards. Woman: Actually, without the credit card information, it would really be free. Based on a true story? I guess, based on the lack of a clear punchline.